The OH1 has an internal, rechargeable battery. Rechargeable batteries have a limited number of charge cycles. You can charge and discharge the battery over 300 times before a notable decrease in its capacity. The number of charge cycles also varies according to use and operating conditions. Do not charge the battery in temperatures under 0 °C/+32 °F or over +40 °C/+104 °F or when the charging contacts are wet. 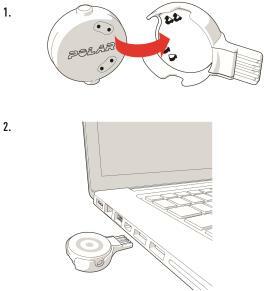 Use the USB adapter included in the product set to charge it via the USB port on your computer. You can also charge the battery via a wall outlet. When charging via a wall outlet, use a USB power adapter (not included in the product set). If you use a USB power adapter, make sure that the adapter is marked with "output 5Vdc" and that it provides a minimum of 500mA. Only use an adequately safety approved USB power adapter (marked with "LPS", "Limited Power Supply" or "UL listed"). Before charging, make sure there’s no moisture, hair, dust or dirt on the OH1 or OH1 USB adapter connectors. Gently wipe off any dirt and blow off the dust. Do not use any sharp tools for cleaning to avoid scratching. To charge with your computer, just plug your OH1 to your computer, and at the same time, you can have it synced it with FlowSync. Place the sensor into the USB adapter with the lens facing up so that the contacts on the sensor and USB adapter meet (picture 1). Plug the USB adapter into a computer USB port or USB power wall outlet (picture 2).